Today on my neverending journey for S60 gratification, I stumbled upon this post by N95 8GB in the Symbian Freak forums that mentioned and provided a download link for an app that will allow you to browse on your S60 phone whilst fooling websites into thinking that it's an iPhone. 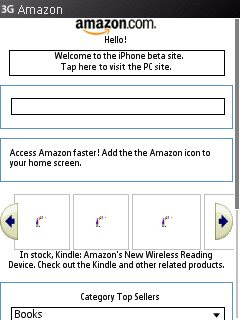 Of course, the S60 browser(atleast the one on the N95 8GB) is technically superior to that of the iPhone but MANY more sites have been optimised to allow for easier browsing on the iPhone and in turn, S60 phones. There was a similar app to this released a few months ago but that didn't seem to work. Read on to find out how. You'll need a hacked S60 phone with the Mobile Signer hack installed and ready. Check out my guides here and here to get this done. Download the iPhonesque app HERE. Now all you need to do is sign the application using Leftup's mobile signer, install it and enjoy! That's the BBC iPlayer site recognising my N95 8GB as an iPhone. 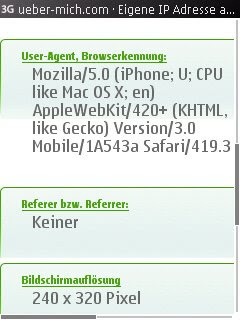 That's ueber-mich.com recognising my N95 8GB as an iPhone. If you want to bring your browser back to normal, just go to the application manager on your phone and uninstall 'iphonesque'. For my American readers: Just saw intomobile's post that says that AT&T will be giving free WiFi to iPhone users. This should work with your S60 phone with the help of this hack! Anyone willing to test it out? Will this work with UK WiFi clouds? JB, I'm not sure. Don't you need to have an account for the cloud hotspots? I'll try and find out anyways. I was using this for awhile, but found it creates issues and denies access to alot of mobile sites. I'm in Canada. I want to remove this app, but am having a hell of a time doing so. Any help would be appreciated. Paul, to remove iPhonesque just go to the application manager in your phone, highlight it and then select remove. This is how I remove it from my N95 8GB. If this doesn't work for you please contact me and I'll look into it. Not a business? pgp.com offers a variety of protections to allow you to find what's right for you.